Fear the Darkness is the follow up to Becky Masterman’s first book, Rage Against the Dying. Retired FBI agent Brigid Quinn is settling into marriage, making friends, and trying to figure out how to fit into her new life in Tucson. To complicate matters, Brigid takes in her sister-in-law’s teenage daughter Gemma Kate who has suddenly taken an interest in dissecting the desert wildlife. On top of her family drama, Brigid has also told a local couple that she will investigate the death of their son. Needless to say, life is far from quiet. Masterman excels at red herrings stories and I love a book that keeps me guessing. She also creates some of the baddest of bad guys keeping her novels intense and suspenseful. Brigid is such a great character. She is resourceful, smart, and one tough-cookie. It has been refreshing to read a main character who is a little older and wiser but can still hold her own in a fight. This is a great mystery series to start reading. Her first book was a nominee for both an Anthony and an Edgar. It's hard to recognize the devil when his hand is on your shoulder. That's because a psychopath is just a person before he becomes a headline….Psychopaths have preferences for Starbucks or Dunkin' Donuts coffee, denim or linen, Dickens or…well, you get the point. Ex-FBI agent Brigid Quinn has seen more than her share of psychopaths. She is ready to put all that behind her, building a new life in Tucson with a husband, friends, and some nice quiet work as a private investigator. Sure, she could still kill a man half her age, but she now gets her martial arts practice by teaching self-defense at a women's shelter. But sometimes it isn't that simple. When her sister-in-law dies, Brigid take in her seventeen-year-old niece, Gemma Kate. There has always been something unsettling about Gemma-Kate, but family is family. Which is fine, until Gemma-Kate starts taking an unhealthy interest in dissecting the local wildlife. Meanwhile, Brigid agrees to help a local couple by investigating the death of their son—which also turns out not to be that simple. Her house isn't the sanctuary it used to be, and new dangers—including murder—seem to lurk everywhere. Brigid starts to wonder if there is anyone she can trust, or if the devil has simply moved closer to home. 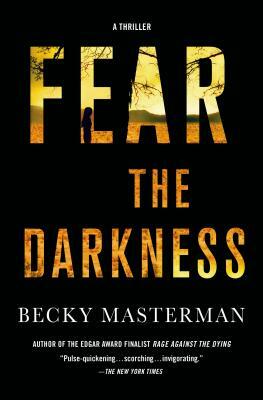 Becky Masterman's Fear the Darkness is the masterful follow-up to the Edgar Award and CWA Gold Dagger finalist Rage Against the Dying. BECKY MASTERMAN, who was an acquisitions editor for a press specializing in medical textbooks for forensic examiners and law enforcement, received her M.A. in creative writing from Florida Atlantic University. Her debut thriller, Rage Against the Dying, was a finalist for the Edgar Award for Best First Novel, the CWA Gold Dagger Award for Best Crime Novel of 2013, as well as the Macavity, Barry, and Anthony awards. She won the Tony Hillerman Fiction Award for A Twist of the Knife. Becky lives in Tucson, Arizona, with her husband.